I’m a storyteller at heart. I take annoying things like having a bad day or lacking faith, and turn them into stories. I like telling you about my son’s compassion and my daughter’s affection, but in a way that you can feel his warmth and her tenderness. I like to take forgettable things and make them a bit more memorable. November is National Novel Writing Month, and I’ve attempted this crazy idea for the last two years. And I’ve already hashed out this year’s attempt, and I’m itching to get started. But I have this problem. There’s a difference between letting people read my blog and letting people read my fiction. The latter is way scarier. I don’t even let my husband read my junk. I kick him out of the room if I’m writing because I JUST KNOW he’s reading over my shoulder from across the room on the couch with the TV on. I’ll be busy next month working on my fiction, and simultaneously working on this hesitancy (or maybe outright phobia) of sharing my fiction. So fair warning, all (or most, or some, or one maybe) of my posts next month will be pieces of my NaNoWriMo (that’s what we veterans call it) project, lovingly titled A Song for the Redeemed. Guys, I am SO GOOD at titling things. AREN’T YOU EXCITED? I am. Or maybe that’s fear I’m feeling. To-may-to, to-mah-to. Good for you, and I’m so excited about starting this year’s NaNoWriMo novel too. I started taking fiction writing course that basically forced me to share my fiction pieces with others–a trial by writing group of sorts. It got easier, but I still have that momentary panic after I share. I need to bite the bullet and sign up for some sort of workshop or critique group or SOMETHING. I tend to hyperventilate even when someone mentions my blog in person. I’m so stinking excited for November and NaNoWriMo! It will be my 11th year of novelling madness, and I only started letting my husband read excerpts two years ago. I have a fancy new notebook, an idea still gelling, and a title: Coffee House Confessions. I just made you my nano friend. Brain farts are the best. Looking forward to it. I’ve been publishing a story on Saturdays on my blog. I just realized this and will now spend significant time ignoring my children today to catch up. 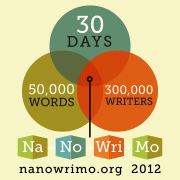 I’ve been thinking about doing NaNoWriMo, but there is NO WAY I’m going to let anyone read anything I write. I can still play, right? Why not? I like to run at it with total abandon…no spell check, no filter, sometimes even no keyboard…I go all retro with a steno pad and a big wad of schoolbus yellow #2’s! I think the NaNoWriMo is about “getting it out.” It’s about proving to yourself that all sorts of incredable stuff is available inside of all of us if we will just spend 30 days to start up the habit of expression. I begin, i write and stay on whatever path the words take me on. Sometimes its pretty kooky, but sometimes its pure and perfect. I think the only real rule (for my interpretation) is to be true to my own word. I promise myself 30 days at 500ish words, and that is what I honor. December 1st, i go back and read where Ive been! Ooh, writing by hand totally gets my creative juices flowing. It’s a nice change of scenery I guess. When my book was eaten, a part of me felt relieved. I just don’t feel like it is ever good enough. And then it was resurrected. Someone emailed me a copy. It’s not the newest version, but it exists. I’m glad you are going for it. No one reads blogs in November. Hah! Totally. And I’m still holding you to that invitation for me to be a beta. Or chi. Or delta. Whatever. I wish I had the energy to write a novel in November, but I’m so exhausted after writing four novels this month. …and there it is, ladies and gentlemen. Good luck to you during NaNoWriMo. Picture me cheering for you. Every word of the way. I miss you. That’s not weird.